Artist Stephan Martiniere, who created this vision of future space travel, will judge the first-ever FarMaker Interstellar Speed Sketch contest at the Starship Congress conference on interstellar travel. From the very beginning we have looked to the stars and dreamed of reaching them, and stories about how we get there and what comes next are a fundamental part of that dream. Good science fiction can amaze and motivate, warn, raise questions and spark the imagination, inspiring human creativity and each new generation of stargazers. Plus, it's just fun to read. 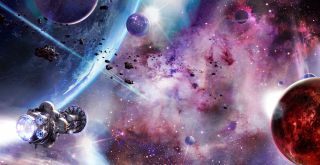 Here are some of the science fiction books Space.com's writers and editors have read and loved — an incomplete list, but one that's always growing. "The Calculating Stars" by Mary Robinette Kowal. Kowal talks with Space.com about the books here; read an excerpt from chapter 1 of "The Fated Sky" here. "Red Moon," the latest novel from legendary science fiction author Kim Stanley Robinson, blends realism and drama in a way that instantly transports the reader to the lunar surface. The book, which takes place 30 years into the future, opens on the journeys of Fred Fredericks, an American quantum engineer working for a Swiss company, and Ta Shu, a poet, feng shui expert and celebrity travel reporter to the moon where they are traveling to work. In the world of the book, China has become the first political and technological entity to inhabit the moon in a serious, long-term way. Read a Q&A with Robinson about "Red Moon" here. Emma Newman's latest book set in her "Planetfall" universe, "Before Mars," sees a geologist arriving at a small Mars base after a lengthy journey only to realize that things aren't as they seem. The base's AI is untrustworthy, the psychologist seems sinister, and the main characters finds a note to herself she has no memory of writing. In a world of perfectly immersive virtual reality, can she trust what she sees? Or did the long trip take a toll on her sanity? "Before Mars" takes place on an eerie, largely empty Mars after a giant corporation buys the rights to the planet. Read a Q&A with Newman here and an excerpt from "Before Mars" here. Space.com talked with Weir about constructing a realistic moon base here. Read an interview with Leckie about the book here. 200 years in the future, humanity has colonized the solar system and is split among three factions on the brink of conflict: Earth, Mars and the Asteroid Belt, which includes the spinning Ceres asteroid colony. As multiple viewpoint characters are ensnared in a system-wide mystery, the story's scope slowly broadens to reveal the full complexity of the novels' science fiction world. The books, co-written by Dan Abraham and Ty Franck, originally stemmed from a tabletop roleplaying game idea, and it shows through the detailed worldbuilding and exploration of a solar system remade in humanity's image. Plus, it's a fun, tightly-plotted set of spacefaring adventure stories. The series is slated for nine books, and they've appeared steadily one per year from 2011-2015 for a total of five so far (plus some tie-in novellas). They're also the basis for Syfy's TV show "The Expanse," recently renewed for a 13-episode second season. Book six, "Babylon's Ashes," is slated for release December 2016. "Aurora" by Kim Stanley Robinson. After numerous novels and short stories probing humanity's trials in the near future, far future and distant past, science fiction master Kim Stanley Robinson offers his own highly detailed spin on the challenge of interstellar travel in his new book "Aurora" (Orbit, 2015). Humanity's first trip to another star is incredibly ambitious, impeccably planned and executed on a grand scale in "Aurora." The novel begins near the end of a 170-year mission aboard a spaceship carrying roughly 2,000 humans to the seemingly Earth-like moon of a planet orbiting a nearby star, Tau Ceti. For more info about the book, check out our Q&A with Robinson. "The Martian" by Andy Weir. Let us know your favorite science fiction books and series in the comments below!